Do you like to play casino games? Do you like to play an awesome Slots game? If your answer is yes, then Pharaoh Slots – Addictive Egypt Slot machines is just the perfect game for you right now. Test your luck with the best free slots game ever! Get the ultimate reward when you hit the jackpot in this addictive slots game. The best thing about this game is you can play and win big for FREE! We created this five reeled slot game with very great graphics and sound to keep you excited. 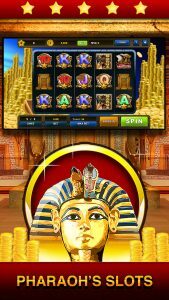 Play Pharaoh Slots for hours and get the huge reward you are always dreaming of. The wait is over because now you can achieve your aspiration. Spin the reels by a simple tap on your screen and hit the jackpot now! Are you looking forward to win BIG? Do you love to spin the slots? Players are always looking for bigger points and coins. You are very lucky because you can now play your favorite slot game and get the reward you always want anywhere and anytime with Pharaoh Slots. It doesn’t take long until you hit the jackpot and reap the reward! 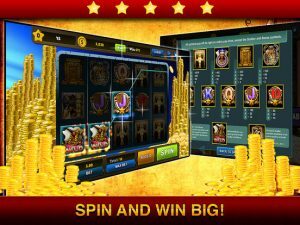 Why you need to download and install Pharaoh Slots – Addictive Egypt Slot Machines on your iPhone or iPad instead of other vegas slots games? • FREE to download and play. No need to spend money to feel the adrenaline rush when you play in a real casino. • Exotic pharaoh theme graphics and immersive sound effects. We took design seriously and we want our users to enjoy this game immensely. • Very simple and straightforward gameplay. Just tap to spin the reels. This is not the game where you need to think or practice to win big. You only need to be lucky. • Numerous win combinations. Unlike other slot games where the chance for reward is low, you can hit a win anytime here. There are many ways to get the jackpot. What are you waiting for? 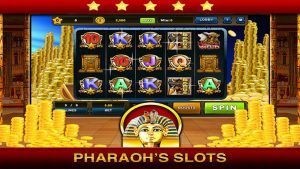 Download Pharaoh Slots – Addictive Egypt Slot machines now and spin the reels for ultimate reward. There’s no better time than now.